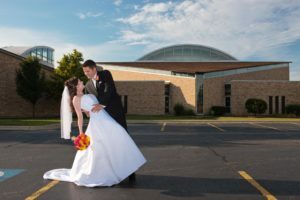 Welcome to the wedding page, a resource for couples who plan to be married at St. Julie Billiart Church. In addition to some preliminary information, this page provides a guide for couples to hear and select music, instruments, and a Cantor for the wedding liturgy. The first step in marriage preparation is to call the parish office at least six months in advance to secure a wedding date and to begin the pre-marriage preparations. Weddings normally take place on Friday evenings or Saturday afternoons, but for good reason they can take place on other days of the week. Your initial call to St. Julie will be directed to our Sacramental Coordinator, Marianne Mueller, who will assist you in reviewing possible dates and completing an initial intake form to set plans in motion. Please note that, although a date may be reserved in this initial conversation, the date is tentative. The date will be confirmed after a priest or deacon has been assigned to the wedding and your intake form has been reviewed. We would suggest that you refrain from moving forward with any other plans, such as booking a hall for the reception, until your date has been confirmed by the Church. Our goal will be to respond within a week of your initial call to finalize a date with you. If circumstances change and you subsequently decide not to be married at St. Julie, please notify the office so that the date and time can be made available to others. You are required to meet with a Priest or Deacon before proceeding with the remaining Church requirements, which will be explained at that meeting. After meeting with the Priest or Deacon, you will complete a Master Wedding Worksheet, which provides us with detailed information about all aspects of the Wedding Liturgy, including your music selections. A copy of this worksheet is available by clicking on one of the two links below. Please refer to the Planning Your Music section that follows to assist you in making your music selections. This web page allows couples to listen to excerpts from all songs currently used for weddings at St. Julie Church. (A complete list of these songs is included on the Master Wedding Worksheet.) Please click on the link below to listen to the song excerpts. The St. Julie Billiart Parish staff is happy to assist you in any way we can as you proceed with your marriage preparations. Congratulations and may God bless you as you prepare for this Sacrament.